Just like with the cover, the first step is opening up the file, which in this case is accomplished by clicking the “Interior Proof” Adobe graphic. 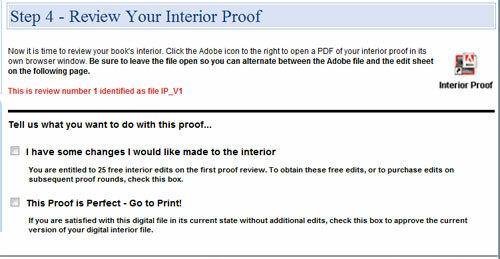 Your interior proof will open in Adobe Reader (if you don’t have the latest edition of Adobe Reader, you can get it free from Adobe’s website at www.adobe.com. The biggest difference between reviewing your cover and reviewing your interior is that your interior is much longer, obviously, and therefore requires a greater degree of concentration and thoroughness. This will also be your chance to get your first glimpse of the interior of your book, and the nature of that “presentation” is going to depend upon whether you selected the standard interior, the enhanced interior, or the custom interior. All three interior choices will result in a great looking book, albeit perhaps somewhat different from how it looked on your Word for Windows word processor or in your head. This difference is a GOOD thing — after all, Word is called a word processor for a reason. If it was meant to be used for book design, it would be called… inDesign, which is the industry standard book design and formatting software we use from Adobe. Our books look like industry standard, high-quality professional books. If/when you see something in your interior file that you wish to correct, you will then select the first box: I have some changes I would like made to the interior. If, after thoroughly reviewing the ENTIRE manuscript, you find nothing you want to fix, look over it again. Perhaps have someone else look over it. Then, and only then, click the second box: This proof is perfect – Go to Print! Hmm, on second thought, look your file over one more time anyway. Since we provide up to 25 free interior corrections, we get a little nervous (i.e., suspicious) when we receive initial galley proofs for the interior without any corrections at all. This usually tells us the author didn’t look the file over at all (and, inevitably, they’ll see something only after the book is published that they’ll wish they had fixed). At that point, revising your publication costs money; so please do everyone a favor and thoroughly review your book now, when 25 fixes are completely free. When you click on the first box indicating that you have some corrections, you will receive a pop-up asking you to acknowledge the fact that you understand your responsibility in finding and bringing to our attention everything you want fixed. Clicking the button to proceed indicates your acceptance, and then the interior edit form appears, just like with the cover….